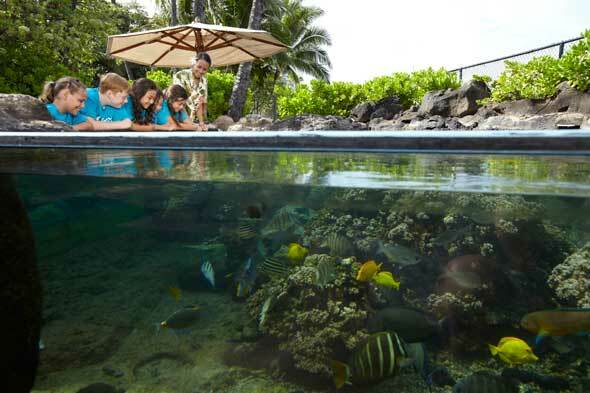 Photos courtesy of Hilton Worldwide, The Limtiaco Company and Oahu Visitor’s Bureau. One foot off the plane, one foot in the sand. It’s really that easy…and heavenly. Starting off with a smooth cab ride (my good life doesn’t necessitate a limo) to the Embassy Suites Waikiki Beach Walk in the heart of Waikiki, we arrived just in time for the “Evening Manager’s Reception,” which beckoned us to the beautiful poolside Grand Lanai where we partook in the quintessential Hawaiian concoction – the Mai Tai. Mixed with the freshest pineapple juice around – mocking remarks from the locals were worth it. Other mentionables from our stay included: the fabulous and free (gotta’ love that!) omelet bar in the mornings; the convenient location to some of the island’s best shopping at the DFS Galleria; and the quick jaunt to Waikiki Beach, one block away. If you want to sleep on the beach, I’d check out the Outrigger Waikiki Reef on the Beach where we passed by several times and saw nothing but happy people. Besides basking near the water with cocktail in tow, there are many activities to experience in Waikiki that can be overlooked by many visitors, such as a visit to Pearl Harbor and the Waikiki Aquarium, both just a short drive away; or an all inclusive tour beyond the beach with the Outrigger Catamaran Eco Sail & Snorkel company. After two days exploring the beach and city life of Waikiki, and in search of a little more laid-back luxury, we took an excursion to the legendary North Shore. 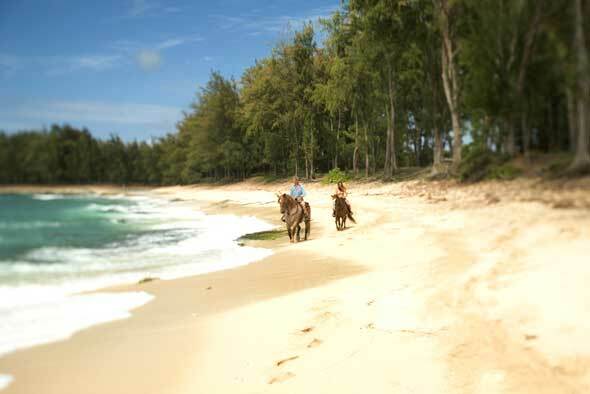 Known by the surfer crowd for the killer waves, there’s oh so much more charm to this oasis, which has been coined “true Hawaii.” From Honolulu airport it’s about a 55-minute drive, and if you’ve ever seen the flick Forgetting Sarah Marshall, then you will recognize the view that can be seen from any cottage on the property of Turtle Bay Resort, just a short drive from the historic town of Haleiwa. This luxurious and pristine property made me feel like a royal as soon as I stepped out of the car. With immaculate décor, top-notch furnishings, and probably the best view I’ve ever seen from in-room, the beach cottage stay at TB is the way to roll. I really did feel like a movie star! My most memorable mentionables here included: the hammocks that dot the property offering an inviting nap overlooking the cliffs and bay at anytime; the ocean-view pool and bar (enough said); the daily delivery of native fresh fruit; the horseback riding on the beach (uber romantic); and the food! I experienced not only the best sleep, the best scenery, but also tasted some of the most deliciously-prepared food at the myriad of restaurants…just a golf cart ride away. You can easily walk, but often there were staff sporting smiling faces who gladly offered a ride. TB’s signature restaurant, 21 Degrees North offered more than my senses could take in at one time, and their crab-crusted Hawaiian sea bass should not be missed. For daytime fare, and just a few steps in the sand from a chair on Bay View Beach, Olá offered a Kalua pork sandwich that topped the charts. If you can peel yourself off the beach or out of your hammock at TB, it’s certainly pays to visit the town of Haleiwa where you will find great shopping for one-of-kind finds, especially at the Hawaiian-chic boutique appropriately named Guava Shop. On your drive there, you must stop for a snack of the freshest Ahi tuna at one of the “poké” trucks, and follow that with classic “shave ice” or as we Mainlanders call it, shaved ice. Hawaiians certainly have an envious style all their own. It’s a wonder I made it back home. ONT offers tours and hikes for the following popular points of interest!